The Introductory Chapters: Introduction: Identification of Oncogenes. Oncogene Activation in Humans. Proliferation Control Pathways: Oncoprotein Function. Growth Factor-Related Proteins. SRC. RAS and RAF. Nuclear Oncoproteins. ETS. FOS and JUN. MYB. MYC. REL. ERBA. Tumour Suppressor Genes: RB1. P53. Other Major Tumour Suppressor Genes. APC. BRCA1. NF1. VHL. WT1. Cell Cycle Control: Cyclin-Dependent Kinase Inhibitors (CDKIs). Apoptosis: Tumour Suppressor Genes and Apoptosis. DNA Repair. Angiogenesis and Metastasis: Angiogenesis. Angiogenic Promoters. Angiogenic Inhibitors. Metastasis: Correlations with Gene Expression. Cadherins. The Immunoglobulin Superfamily (IgSF), Neural Cell-Adhesion Molecule (NCAM). Integrins. CD44. Matrix Metalloproteinases (MMPS). Tissue Inhibitors of Metalloproteinases (TIMPs). Cysteine and Aspartic Proteinases and Heparanase. NME1 and NME2. The Multi-step Nature of Cancer: Cervical Carcinoma. Colorectal Carcinoma. Breast Carcinoma. Prostate Carcinoma. Renal Cell Carcinoma. Lung Carcinoma. Lymphomas. Chronic Myeloid Leukemia. Gene Therapy for Cancer: Nucleotide Sequence-Targeted Strategies. Tumour Suppressor Gene Therapy. Cytokine Gene Therapy and Tumour Vaccination. Virally Directed Enzyme Prodrug Therapy (VDEPT). Antibody-directed Therapy. Tables: Oncogenes Transduced by Retroviruses. Oncogenes Activated by Retroviral Insertion. Oncogenes at Chromosomal Translocations. Tumour Suppressor Genes Detected in Human Tumours. Functions of Oncoproteins. Chromosome Locations of Human Proto-Oncogenes and Tumour Suppressor Genes. ABL. AKT1 and AKT2. BCL2. BCL3. BCR. CBL. CDK4. CRK. CSFIR/FMS. D Cyclins. DBL. EGFR/ErbB. ELK1. EPH. ERG. ETS1 and ETS2. FGR. FLII. FOS. FOSB. FPS/FES. FRA1 and FRA2. FYN. HCK. HER2/ErbB-2/Neu. HER3/ErbB-3. HER4/ErbB-4. HSTF1/HST2. INT2. JUN. JUNB. JUND. KIT. LCK. LYN. MAS. MAX. MET. Mil. MOS. MYB. MYC. PDGF/Sis. PIM1. RAF. RAS. REL. RET. ROS1. SEA. SKI. SRC. TAL1. THRA/ErbA-1 and THRA2/ErbA-2. TIAM1. TRK. VAV. WNT1. WNT2 and WNT3. YES1. APC and MCC. BRCA1 and BRCA2. DCC. DPC4. E2F1. E-cadherin/CDH1. MSH2. MSH3. MSH6/GTBP and MLHL. NF1 and NF2. P53, PTC. The Retinoblastoma Gene (RB1). TGFBR1 and TGFBR2. VHL; WT1. INK4A/MTS1/MTS2/CDK41/CDKN2. INK4B/MTS2. INK4C and INK4D. KIP1. KIP2. WAF1. DNA Tumour Viruses: Human Papillomaviruses. Epstein-Barr Virus. Subject Index. 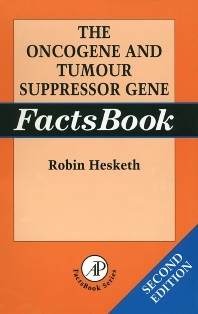 The Second Edition of The Oncogene and Tumour Suppressor Gene FactsBook has been completely revised, updated, and expanded by 60%. The book contains more than 80 entries on oncogenes including JUN, MYC, and RAS, as well as DNA tumour viruses, tumour suppressor genes, including p53, retinoblastoma, BRCA1, BRCA2, VHL, F2FL, and essential material on angiogenesis and metastasis, apoptosis, cell cycle control, and gene therapy.